A strong public health system is essential to improving and protecting people’s health. The role of public health may be most visible in the face of threats such as Zika or Ebola, but in reality, public health works to protect us every single day. Whether it’s investigating foodborne illness outbreaks, monitoring the quality of water, ensuring that all children have access to life-saving vaccines, or providing nursing care from infancy to end of life, public health protects the fundamental building blocks of healthy people and communities. That’s why public health can’t just suspend its everyday functions when an emergency such as Zika strikes. Public health must be able to maintain its core functions and support its ability to rapidly respond to serious disease threats and disasters. Today the Oswego County Health Department provides a look at preventive services provided by the Nursing Division. OSWEGO COUNTY – The Health Department’s Preventive Department takes the lead role in preventing the spread of disease and related disabilities. The county health department’s nursing staff works with health care providers to make sure children are vaccinated against communicable diseases. 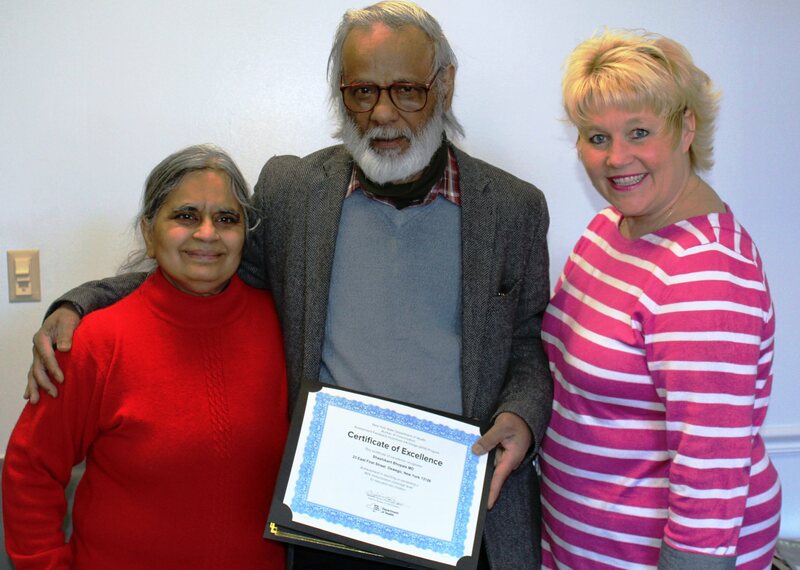 In 2016 Oswego pediatrician Dr. Shashikant Bhopale received a certificate in recognition of his patients’ high immunization rates. From left are: Mangala Bhopale, receptionist; Dr. Shashikant Bhopale; and Tina Bourgeois, LPN and member of the health department’s immunization team. This is achieved through disease investigations, providing immunizations and monitoring immunization rates, reviewing and following up on lead test reports for county children, collaborating with area health care providers, and educating the public. In 2016, the Oswego County Health Department conducted about 800 investigations related to reportable diseases. Vaccines have brought a dramatic reduction of new cases of infectious diseases and their devastating effect over the last 100 years. However, vaccine preventable diseases, such as measles, mumps, and whooping cough are on the rise in this country due to lack of immunization. The Health Department monitors and controls the spread of communicable and infectious diseases by providing illness surveillance, implementing and recommending communicable disease control measures, and ensuring that patients are treated appropriately to prevent the spread of illness in Oswego County. Vaccinations play a big role in preventing certain infectious diseases. They can protect infants, children, teens, adults and travelers of all ages from serious diseases. There are 14 vaccine preventable diseases. Due to vaccines, some diseases have become rare in the U.S.
“Working with health care providers throughout the county, we have seen the percentage of two-year-old children who are fully immunized climb from 54 percent in 2013 to 73 percent this year,” said Deborah McCarthy, immunization coordinator with the County Health Department. Immunization clinics are held at the County Health Department, 70 Bunner St., Oswego, every Tuesday from 12:30 to 3:30 p.m. and at the Pulaski Courthouse on the third Tuesday of every month by appointment from 9 to 11 a. m.
Lead poisoning is another potential health threat tackled by the Preventive Nursing Division. “Lead poisoning remains a major preventable public health problem in the United States,” said Martin. Lead can affect nearly every system in the body and causes learning disabilities and behavioral problems. At extremely high levels, lead poisoning can cause seizures, coma and death. Lead poisoning often has no symptoms early on and can go undetected without a blood lead test. The Oswego County Lead Poisoning Prevention Program works to decrease lead poisoning among children. Health officials work with parents and caregivers to explain the dangers of lead poisoning and the importance of testing all children at ages one and two. Lab tests for lead are reviewed daily to identify those with elevated blood lead levels. If lead levels are high (10 mg/dl or above), the health department works with the family to identify lead sources in the home, and to ensure that all lead hazards are removed from the home. The Legislature’s Health Committee oversees the day-to-day operations of the health department. In addition to Legislator Proud, committee members include legislators James Karasek, committee vice chairman, District 22, Granby; Frank Castiglia, District 25, Fulton; Heather DelConte, District 18, Oswego; Margaret Kastler, District 1, Sandy Creek; Morris Sorbello, District 23, Granby; and Terry Wilbur, District 21, Hannibal.